Even though it’s a bank holiday, the bunnies have still been practicing hiding from Monday with varying degrees of success. Little Luna Eclipse has been sheltering from the blazing sunshine. Like the rest of the Rabbit Residence rabbits and the weary human workers she’s hoping that the sun doesn’t come out tomorrow. Maximus can’t wait for the weekend to begin! Things don’t get much fluffier than this. Little Atom with his wifebun in his forever home. everyone loves bunnies little moufs. Here's Darius. I think you'll all agree he's doing an amazing job of hiding from Monday. Turns out the lesser spotted Odyssey isn't great at hiding from Monday. Noella has definitely been one of our more challenging buns to bond. She came to us from The Warren Bunny Boarding after she fell out with her older partner. Many people fell in love with her as even though she is shy, she's adorably cute. We sometimes joke about the witching hour when we bond, usually if a fight breaks out it will be about 2am. All I can say is Noella had definitely got wind of this, I lost count of the number of times a promising bond got to 2am just as I was drifting off to sleep on the too short sofa and Noella would take a sudden dislike to her new friend and all hell would break loose. Once I even drove her back to the rescue at 4am in my pjs. 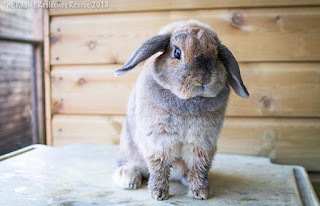 Noella recently met Rolo, it definitely wasn't love at first sight but he was the first rabbit she didn't feel the need to chase him and pull fur until I was a jibbering wreck, so we persevered. Using the guineapig run as Rolo had demonstrated his ability to fit his head through a 3 inch gap in my bonding pen nearly giving me heart failure. Rolo's idea of courting was to launch himself at Noella and flop on top of her, interesting to say the very least. Eventually he won her over either that or she was bored into submission. So two weeks ago after 14 days of careful bonding Noella went to her forever home. She might be small but she was indeed mighty and will be some bun I always remember. Plus it goes to show that there is some bun out there for every bun.